Sunday’s were made for relaxing, taking it slow, easy. 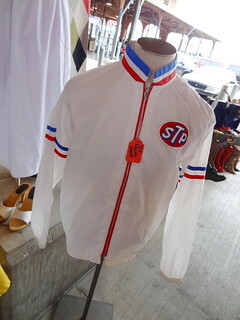 It’s a day to sleep in, enjoy a leisurely cup of coffee, go shopping just for fun. 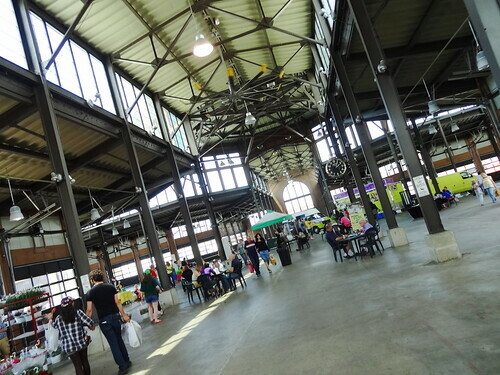 If that sounds good to you, we have just the place for you to spend a Sunday: Eastern Market. 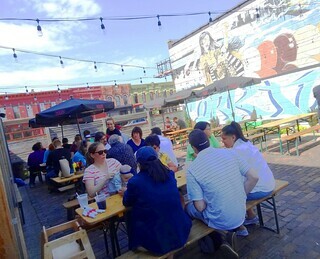 That’s right, since the beginning of June, sheds 2 and 3 are home to the new Sunday Street Market; let’s have a look. 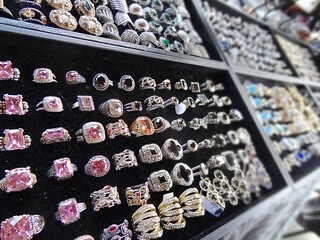 Parking is a cinch compared to your average Saturday; we are in front of Germack Coffee, perfect, we grab a cup to go, cross Russell Street and begin to browse the market. 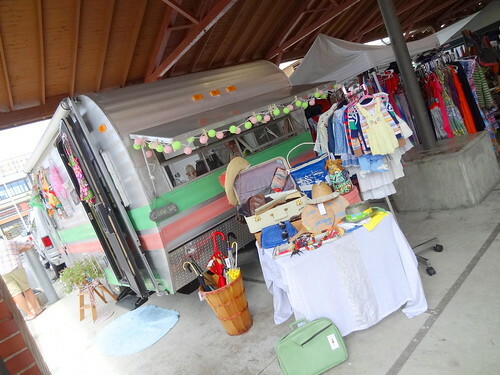 Shed 2 is open-air; a cute vintage trailer with pink and green stripes is parked just inside the entrance, a swimsuit hangs from the open door, scarves hang from a line on the side. 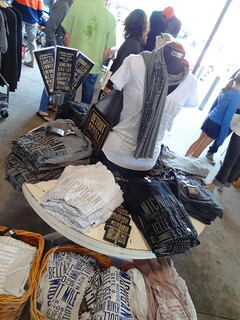 A table in front holds old hats, suitcases and other funky items, the set-up is great, like an outdoor vintage store. Across the way an artisan has set up shop, Two Stix 5 Stones sells handmade knits and accessories; her shawls are gorgeous. 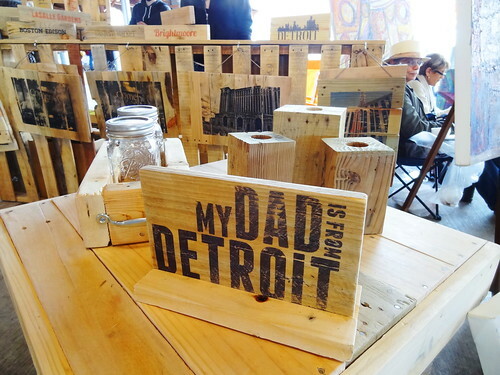 We take our time strolling past various booths, there’s a nice mix of antiques, handmades and vintage; a mannequin wears a cool old STP jacket, photographs of iconic Detroit buildings are transferred onto pieces of wood, a large jewelry case holds rows of antique rings. Rehash By Amy has taken ordinary light fixtures, given them a whimsical paint job and converted them to solar power, what a great idea! They would look fabulous hanging above a porch or deck. Across the way we spot a grouping of antique signs; Coke, beer and old street signs are all for sale along with a parking meter, you never know what you may find. 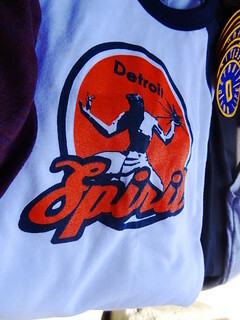 There are a few different T-shirt makers, another booth has a wide selection of items from automotive pieces to the old aprons the newsboys used to wear. 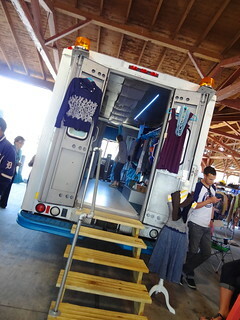 On my right I notice an old delivery truck that has been converted into a boutique; step up into the make-shift store, clothing hangs from a rack on the right, accessories are on the left, very clever! Making our way to Shed 3 we pass The Detroit Pop Shop, flavors include chocolate peanut butter banana, blueberry lemonade and cucumber lime basil; by the number of people eating them, I’d say they’re pretty popular. 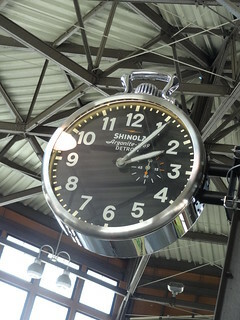 Shed 3 is completely enclosed, a large Shinola clock hangs from a post, food trucks are serving up lunch, there’s even a gelato truck. 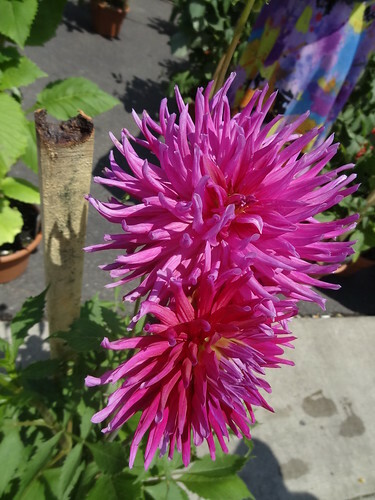 A few vendors are selling fresh fruits and veggies, another is selling flowers; dahlias are eye-catching in peachy-pink, scarlet and lavender, zinnias are blooming in bold red, yellow and orange. 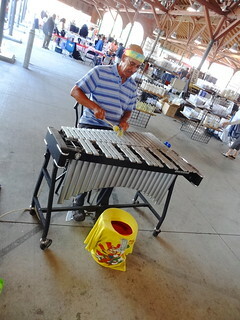 Live music is being played in the distance, sounds like a xylophone, buskers perform throughout the market. 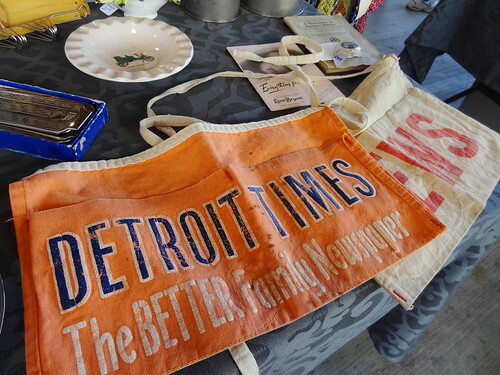 Looks like the Sunday Street Market is a hit! 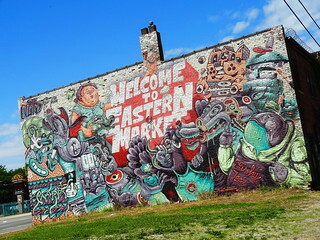 The Eastern Market area is also known for its vast array of graffiti, it’s fun to drive up and down the streets looking for new pieces. 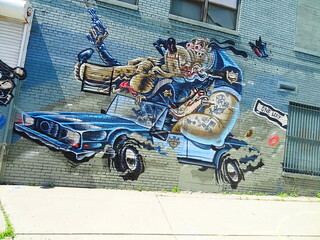 Right on Russell St a huge mural covers the front and side of Wholesale Produce Distributors; done in shades of turquoise and purple on a tan background, a slew of characters from a guy in a hat, to a shark, are in action. Take the time to really absorb it, the detail and expressions are fabulous! I still favor the grazing cow on the side of Eastern Market Cold Storage, it’s like he’s watching over everybody while he eats—-we are his entertainment. 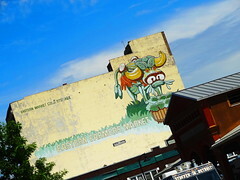 There’s another cool one over on Division, the Greenbriar Foods and Corridor Sausage building; it’s a great scene with a cool cast of characters. 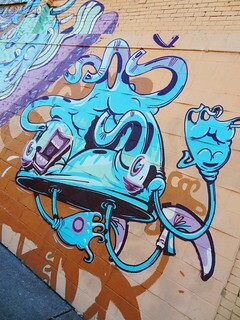 Throughout the area you can find wild colors, groovy settings and hip creatures on anything from a building to a dumpster or a roll-up door. 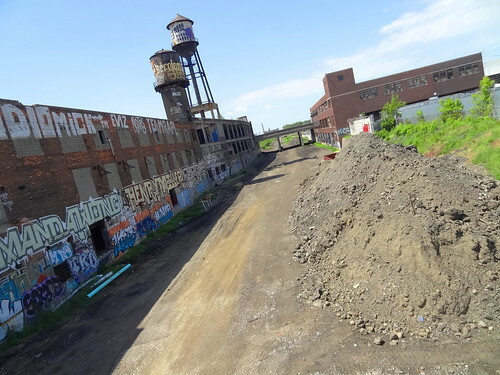 We did stop to check the progress on the expansion of the Dequindre Cut, currently running from the riverfront to Gratiot, when the next phase is completed it will continue all the way to Mack; look for it to be completed sometime after Labor Day. 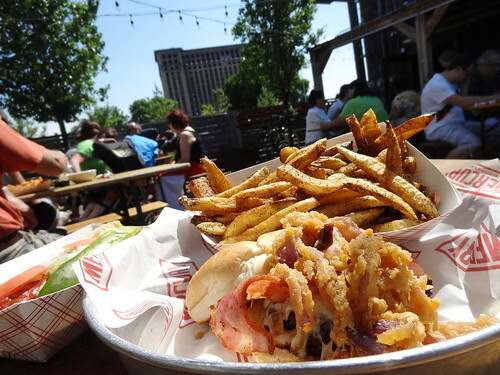 It’s such a lovely day we are having lunch on the patio at Mercury Burger Bar on Michigan Ave. 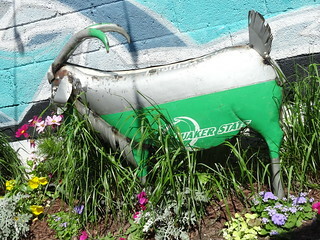 The space is really charming; picnic tables are right at home on the brick patio, gardens surround the fence line, nearest to us a goat made from a recycled Quaker State sign appears to be eating the flowers. A graffiti mural covers one wall, strings of lights criss-cross over head, I bet it’s a sweet place to hang out in the evening. While we wait for our food to arrive I notice many Boston Coolers and shakes being delivered to surrounding tables, mmmmm, they look good…… Before long our meal is set in front of us; the French Onion Burger is wonderful, the meat is tender and juicy, topped with crisp bacon, carmelized onion, Gruyère cheese and onion straws, makes you hungry doesn’t it? The Chicago Dog is done up right; mustard, relish, tomatoes, sport peppers, onions, pickle and celery salt packed into a poppy-seed bun. No meal would be complete without an order of Mercury’s hand-cut fries, the sea salt and black pepper are our favorite; the perfect amount of seasoning on incredibly fresh, just from the deep fryer fries…..yum!